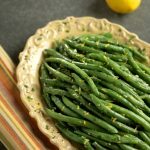 This creative combination of crunchy green beans with creamy roasted garlic and squash, is topped with fresh green onions, cilantro and pumpkin seeds to create a versatile and filling meal. 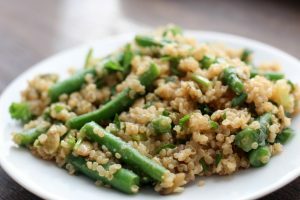 Using quinoa as the base, this can be served warm or cold and pairs well with chicken or chickpeas rounding it out as a full meal. If you don’t have the time to roast the squash and garlic, substitute them with cubed fresh red pepper and store-bought roasted garlic. 1 bulb garlic. 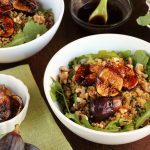 You will use 3 cloves of roasted garlic for this recipe*. Preheat oven to 350°F. Line baking tray with parchment paper. Cut top off entire bulb of garlic so you can just see the tips inside. Place on prepared baking sheet and drizzle lightly with olive oil. In a bowl, drizzle olive oil over cut squash and season to taste with salt and pepper. Spread evenly on the prepared baking sheet. Then roast squash and garlic for approx. 10 min. Remove and turn the squash. Return to the oven and roast for another 10-15 minutes until squash is tender; then remove from baking tray and place in large mixing bowl. Garlic will likely need to go back in for another 10 minutes until the garlic inside looks light brown. While the squash and garlic are cooking, prepare other ingredients. 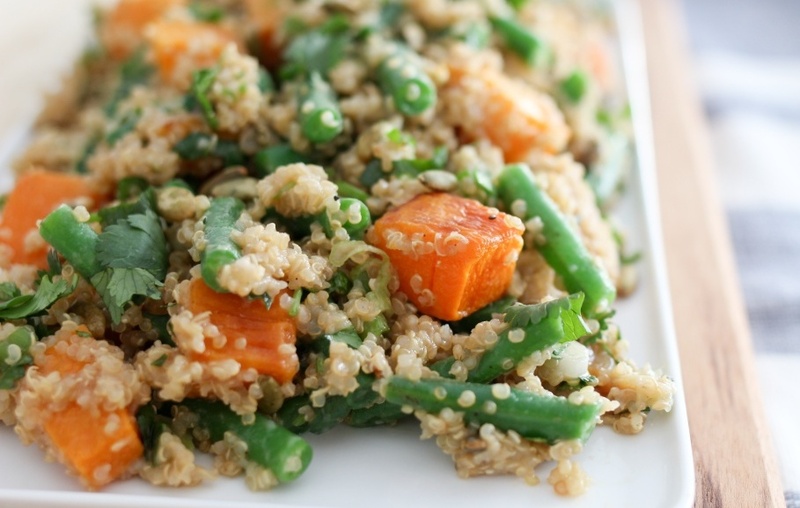 Cook quinoa as per instructions in 1 cup vegetable stock and 1 ½ cups of water. Set aside while squash and garlic roast. 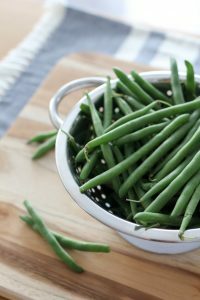 Steam green beans for approx. 5 minutes depending on desired softness. They should turn a beautiful bright green. Drain and add cold water to them to stop the cooking process. This will help them retain the lovely colour. Drain well and set aside. Trim and finely chop green onion. Wash, dry and finely chop fresh cilantro. Remove 3 cloves of roasted garlic and smash with a fork in small mixing bowl. Then combine with coconut milk and peanut sauce. If desired, lightly toast pumpkin seeds or peanuts. When all of the ingredients are ready, mix them together except the cilantro and dressing in large bowl. When combined, fold in the dressing, followed by the cilantro. Sprinkle with seeds or nuts. 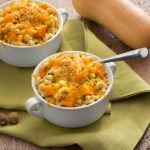 This can be enjoyed warm or cold and pairs well with chicken or chickpeas to make it a full meal. Serves 6 generously as a side or 3-4 as a main. *Alternatively, you can buy prepared roasted garlic. 1 tsp = 1 clove. If you do make the entire bulb of garlic, enjoy the rest of it in many other ways. Add it to soups, casseroles and stir fries or just spread it on crackers, toast or a baguette and top with your favourite cheese. Developed by NicoleBurnsFood for Produce Made Simple. Nicole is a mother of four who likes to cook and once upon a time sold baking professionally. With a background of food industry know-how, Nicole writes about interesting and relevant facts about food through her research.